The effects of rising marijuana use are showing up in the delivery room, according to Dr. Lester A. Ruppersberger, a Langhorne-based obstetrician and gynecologist. An increasing number of women are ingesting marijuana during pregnancy, with evidence “overwhelmingly [indicating] that cannabis … during pregnancy and possibly in the post-natal period … has the potential to cause long-term harm,” said Ruppersberger. THC (tetrahydrocannabinol), the psychoactive compound in marijuana, “freely crosses the placenta” and can be found in breast milk, he said. Studies have linked marijuana use during pregnancy to anemia, low birth weight and adverse neurological development, including hyperactivity and poor cognitive function. Ingestion also increases the risk of fetal death by 5 to 10 percent. 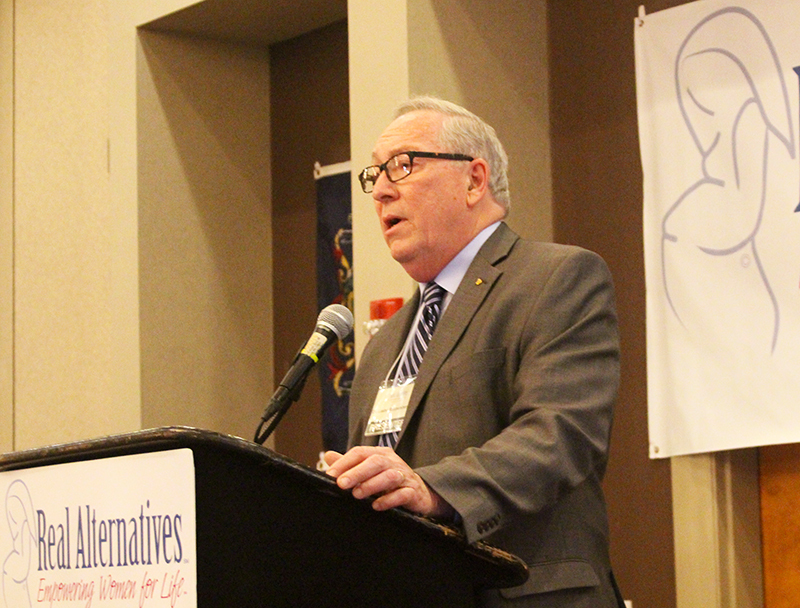 Ruppersberger, the former president of the Catholic Medical Association, shared his insights at a March 28 gathering of service providers for Real Alternatives, the non-profit organization that administers Pennsylvania’s Pregnancy and Parenting Support Services Program. Earlier at the Harrisburg-area event, archdiocesan Catholic Social Services received its seventh consecutive award for service provider of the year. Part of the problem with current marijuana use, said Ruppersberger, is a lack of awareness regarding the potency of today’s cannabis products. In the 1980s, marijuana typically had a THC content of about 3.8 percent. By 2014, that figure had risen to 12.2 percent, and today THC levels range from more than 50 to 80 percent in a given cannabis extract. “One marijuana joint now would equal about 17 back in 1970,” said Ruppersberger. In addition, a growing number of states have legalized or decriminalized marijuana use, creating a “false sense of security” about the dangers of marijuana, he added. At present, 33 states allow medical marijuana use; 10 states and the District of Columbia permit both recreational and medical cannabis. Pennsylvania recognizes medical marijuana, as does New Jersey, which is also seeking to approve recreational use. Yet such legislative acceptance — along with an increasing public view that cannabis is harmless — can mask the serious consequences of marijuana for mothers, fathers and children, said Ruppersberger. Cannabis has been shown to increase users’ heart rates while impairing coordination and cognitive functions. Anxiety, paranoia and even psychosis can result from use, while those who ingest marijuana through smoking also risk lung cancer and other lung diseases. Unlike heroin and cocaine, marijuana is popularly regarded as non-addictive, but “chronic consumption can lead to marijuana use disorder,” which in severe cases can take the form of addiction, said Ruppersberger.